Home / Archive by category "Things to know about Rome"
You’ll notice with your eyes that Rome public transports are not so efficient as you’d expect from a capital of an european country: buses stuck in the jam or not respecting the timetable happen frequently. As the city center is better to be walked – the slow walking speed will let you appreciate much more the appeal of the narrow ancient alleys, you’d probably would have the unfortunate idea to reach the catacombs by regular bus instead of the dedicated hop-on off lines, and you could wait along via Appia even for one hour under the heating sun before a bus would come to pick you up – how many german folks slowly cooking under the sun and me saying “hello” speeding on the scooter LOL. Few years ago public transports network was equipped with GPS, so actually some city center bus stops output the waiting time of the bus line you’re waiting for, as the GPS data are public as well this is where this app comes essential: tap its magnifying glass and input the bus stop number or the bus line and it will come up with the waiting time info you need. It also locate your buses direction route from point You’ll notice with your eyes that Rome public transports are not so efficient as you’d expect from a capital of an european country: buses stuck in the jam or not respecting the timetable happen frequently. As the city center is better to be walked – the slow walking speed will let you appreciate much more the appeal of the narrow ancient alleys, you’d probably would have the unfortunate idea to reach the catacombs by regular bus instead of the dedicated hop-on off lines, and you could wait along via Appia even for one hour under the heating sun before a bus would come to pick you up – how many german folks slowly cooking under the sun and me saying “hello” speeding on the scooter LOL. Few years ago public transports network was equipped with GPS, so actually some city center bus stops output the waiting time of the bus line you’re waiting for, as the GPS data are public as well this is where this app comes essential: tap its magnifying glass and input the bus stop number or the bus line and it will come up with the waiting time info you need. It also locate your buses direction route from point A to point B. Water was one of the main resources for the city during the centuries, it is fresh good tasting coming from Abruzzo sources the mountain region next to Lazio. 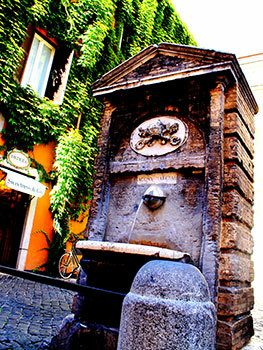 It is still delivered through the ancient roman acqueducts such as Acqua Vergine in the Vatican area and surroundings or through modern ones. Pope Sisto IV of Barberini family put masterpiece fountains along the roman streets intersections to water thirsty pilgrims along their route to visit the five Basilicas. IMO you won’t find a better tasty and refreshing free tap water, and I travelled a lot. Because of this the city is peppered of small tap water fountains called Nasoni – which means big noses because this dark grey short columns have a long curved stick like a long nose from where the water spill off continously, if you stop up the bottom of the stick, water will spill out from a little hole to water you. This app will locate you and show up the closest nasoni to you, in the goggle maps style. My suggestion: buy a small mineral water plastic bottle, when empty tap the app, locate the closest nasone and refill your bottle. Top of the pops for this great app, it locates you through the smartphone built-in GPS and will show up the interesting spots around you using offline data, no 3G at all! Interactive monuments, attractions and sights descriptions, maps, public transports. A must have.